There was originally supposed to be a panel on Yookoohoos at the upcoming OzCon, but since it’s been cancelled, I might as well say a bit about the subject here. 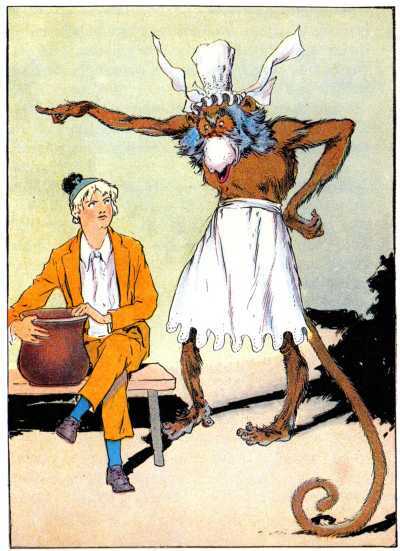 I wrote about the two main Yookoohoos in the Oz series, Mrs. Yoop and Reera the Red, way back in the day. So what is a Yookoohoo? 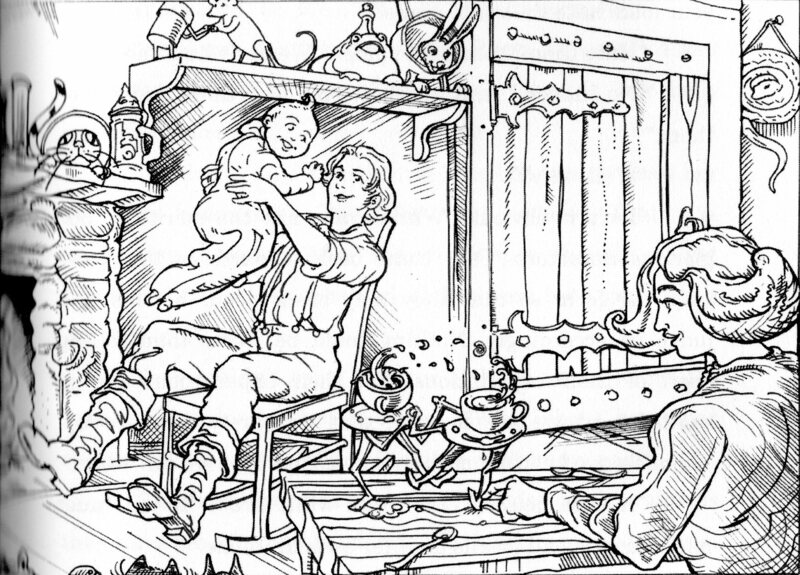 As defined by Mrs. Yoop in The Tin Woodman of Oz, they’re Artists in Transformations, as in magical shape-changing. Mrs. Yoop transforms pebbles and grass in order to make food for herself, and turns prisoners into different forms for her own amusement. 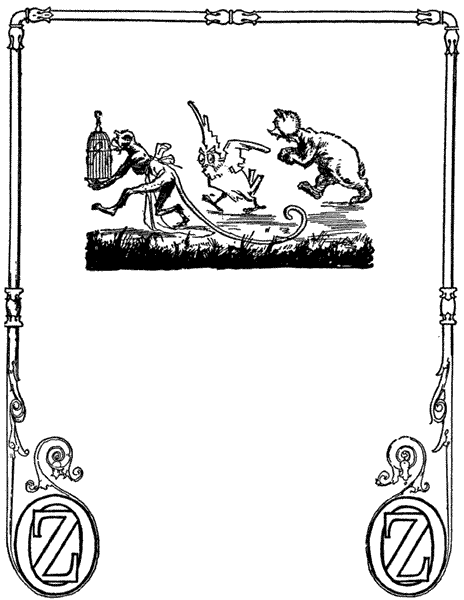 When she captures Polychrome, Woot the Wanderer, the Scarecrow, and the Tin Woodman, she turns into them a canary, a green monkey, a bear, and an owl, respectively. Despite her assurance that nothing she transforms ever turns back, Ozma is able to change back all of them except Woot, whom she must use a body exchange to give back his original shape. What’s interesting is that she seems to contradict herself anyway, saying that she turned herself into a mouse in order to escape the people who captured her husband, then changed herself back. 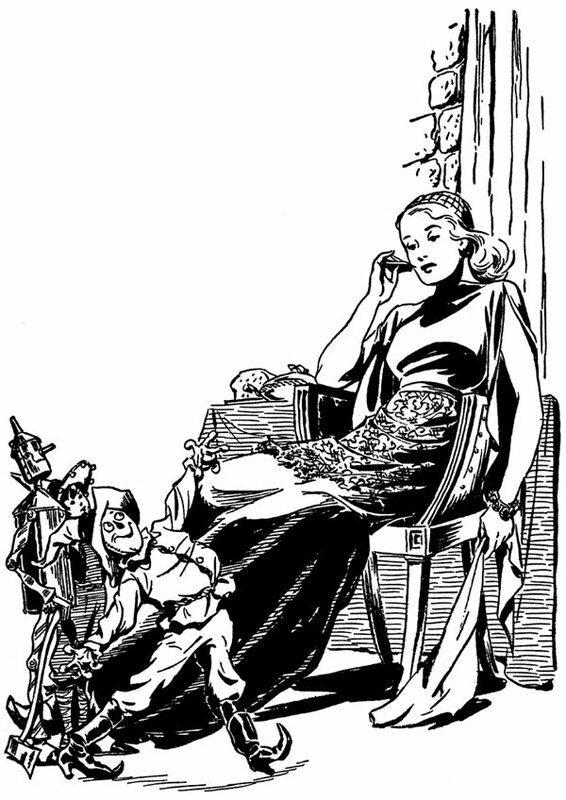 Reera, introduced in Glinda, is a reclusive woman with several pets, and she constantly changes both their forms and her own. Ervic the Skeezer has to trick her in order to get her to disenchant the Three Adepts, but she seems okay with it once she comes to realize she’s been fooled. 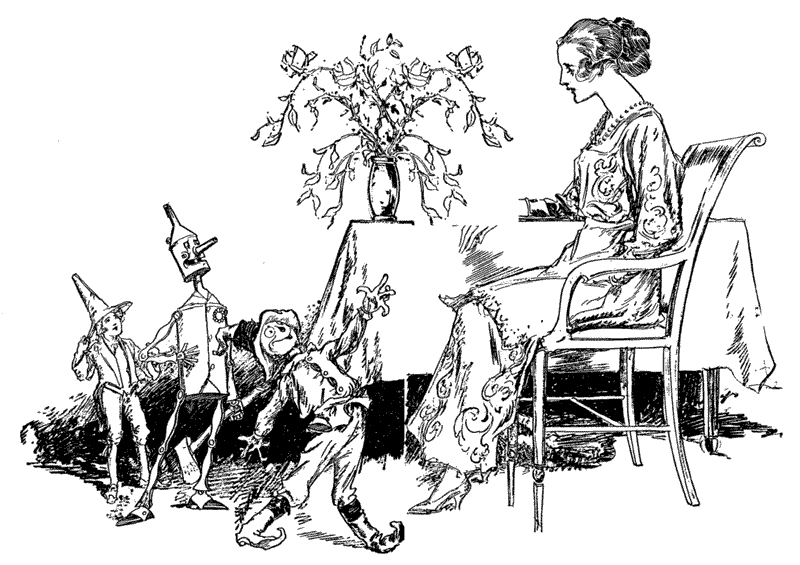 She first shows up in the form of a gray ape, although I’ve heard that L. Frank Baum’s original draft made her a skeleton, which the publisher presumably found too scary. Although Mrs. Yoop is villainous and Reera just unsociable, they have some significant things in common. Both live alone, and while Mrs. Yoop is married (to Mr. Yoop, of course), she doesn’t seem to particularly miss him after he’s captured and imprisoned. They do get lonely, but only want companions on their own terms. In Mrs. Yoop’s case, that means keeping prisoners, while Reera’s pets are presumably willing roommates. The two of them also come across as restless, always wanting to turn things into other things even when it isn’t strictly necessary. 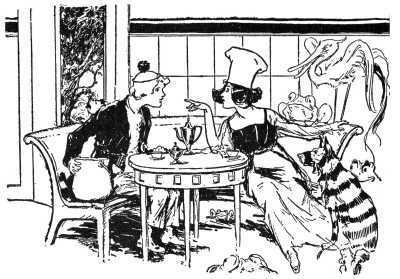 Another similarity is that both wear lace aprons, although Mrs. Yoop’s has magical properties, and we don’t know whether Reera’s does. Although all of the other official Oz authors used magical transformations in their books, they never did anything with Yookoohoos. Later writers did provide some new experiences for the two we’d already met. In this post, I looked at a few works that tell how Mrs. Yoop tried several times to rid herself of the green monkey form, with the only time she succeeded having her end up as a turtle instead. Reera desires a child and gets married to Prince Glenn of Portmore in Richard Quinn’s Red Reera the Yookoohoo and the Enchanted Easter Eggs of Oz, shows up without a husband in Edward Einhorn’s Living House, and gets together with Ervic in the recent short story “Unsociable,” by S.A. Samuelson. What we don’t really see until Paul Dana’s Time Travelers is any other Yookoohoos; the only exception I can think of offhand is King Transformer of ElectraCity from Henry Blossom’s Blue Emperor, and he’s a living electrical component, so I’m not sure if it works the same way for him. Paul introduces an entire family of Yookoohoos, and I’d better put in a SPOILER WARNING for all of his Oz books. Mrs. Yoop (whose given name is Moyna) and Reera are revealed as sisters, and daughters of the matriarch Grandma Natch. Her third daughter, Yada, is discovered in Lost Boy to be Button-Bright‘s biological mother, and the boy turns out to have Yookoohoo powers himself. A male Yookoohoo is a rarity, however, and while daughters tend to strike out on their own as children, sons are often protected. Grandma Natch’s niece, Ramana Radget, has a son named Kram and two daughters, Jenta and Bina. The latter’s story hasn’t been published yet, but if you look closely at the Royal Timeline of Oz, her more familiar identity is given away there. Another two Yookoohoos, Jona Slitely and Rodi Arside, a couple who live in the Quadling Country, are introduced in Yookoohoos. According to Paul, they’re related, but distantly enough that their being together isn’t incestuous. Most of the others are loners, although family remains important to them, so they do visit each other at times. Reera is also revealed to have a daughter, Fardel, although she introduces herself to the family in the guise of a boy called Delfar. She has the limitation of being unable to transform herself, just as Moyna Yoop has the one of not being able to change things back after she’s transformed them (except possibly herself, if her mouse story is true). Ervic is the father, although he and Reera don’t live together. There is a brief mention of her having a marriage that failed, but no details on what happened to Glenn. Joe Bongiorno once told me that when he mentioned the book about Reera getting married to Edward Einhorn, he jokingly suggested that her husband could have been the Bumblebeast who’s guarding the approach to Reera’s hut in Living House. Yookoohoos can also have magical specialties, like Rodi’s artistic designs and moving objects, Jona’s foodstuffs, and Fardel’s machines. If we’re going to accept King Transformer as a Yookoohoo, maybe he was created by a member of the clan. They use talismans to focus their magic, and Moyna’s is her apron, which also opens doors. It’s not entirely clear what happens to it, as we never see it again after Woot is changed back to his human form. 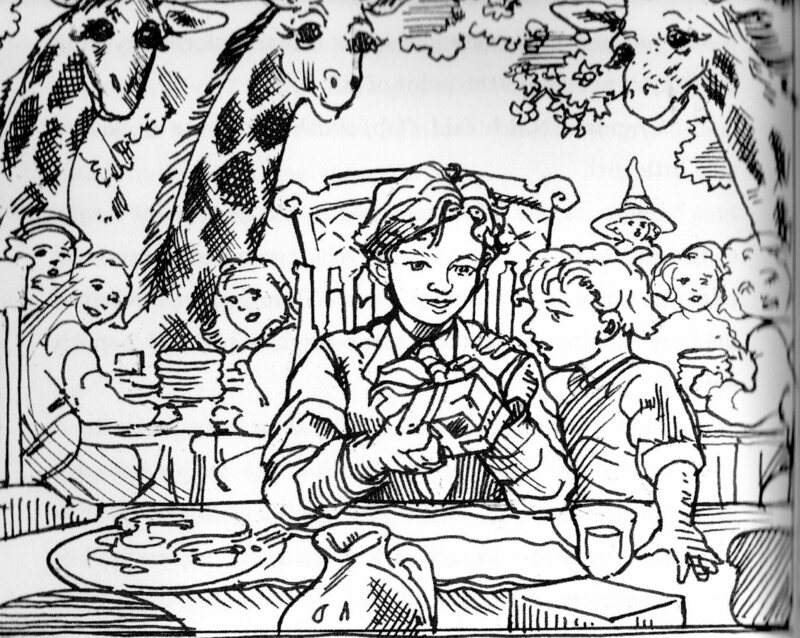 Taking into account Ozma’s tendency in the Ruth Plumly Thompson books to keep magic items she comes across safely locked up, I tend to think it’s another one of the treasures in her palace. This entry was posted in Animals, Characters, Edward Einhorn, Families, Fred Otto, L. Frank Baum, Magic, Magic Items, Oz, Oz Authors, Relationships and tagged bumblebeast, button-bright, ervic, glinda of oz, grandma natch, green monkey, henry blossom, joe bongiorno, jona slitely, king transformer, magic apron, mrs. yoop, ozma, paul dana, polychrome, prince glenn of portmore, ramana radget, red reera the yookoohoo and the enchanted easter eggs of oz, reera the red, richard g. quinn, rodi arside, royal timeline of oz, s.a. samuelson, scarecrow, the blue emperor of oz, the living house of oz, the lost boy of oz, the tin woodman of oz, time travelers of oz, tin woodman, transformation, unsociable, woot the wanderer, yada natch, yookoohoos. Bookmark the permalink.